Zephaniah prophecy that Moab and Ammon would be like a place of nettles is in Zephaniah 2:8-11. Zephaniah was a minor prophet and a fourth generation descendent of King Hezekiah. Most likely he lived in Jerusalem and ministered between 640-630 B.C. during the early years of King Josiah’s reign. His words reflected a familiarity with court circles and political issues. He seemed to know firsthand Judah’s rejection of God and the idol worship which occurred under Kings Manasseh and Amon. The book of Zephaniah is three spell-binding chapters that not only announce God’s pending judgment on Israel but God’s judgment on many nations living in the region, e.g., Philistia, Moab, Ammon, Cush, and Assyria. Zephaniah’s prophecy which included the nettle plant was against Moab and Ammon. Both the Moabites and Ammonites were offspring of Lot and his incestuous union with his two daughters (Genesis 19:30-38). From the time Israel attempted to pass through Moab on their way to the Promised Land, there was enmity between Moab and Israel (Numbers chapter 21-26). Ammon initiated war on Israel in the time of Israel’s judges (Judges 3:12-13). Zephaniah began his prophecy against Moab and Ammon by writing that God heard their insults, taunts, and threats against Israel. God was aware of the pride of the Moabites and Ammonites. In retaliation for their behavior, Moab would become like Sodom and Ammon like Gomorrah. Both would become places of nettles and salt pits, a wasteland forever. God’s declaration that Moab and Ammon would become like Sodom and Gomorrah should have disturbed the Moabites and Ammonites. Their ancestors (Lot and his daughters) once lived in Sodom. Ancestral history would have included tales of God reigning burning sulfur on the two cities (Genesis 19:23-29). The outcome was fiery destruction of the cities, people, and vegetation on the plain where the cities were located. Many botanists agree that the nettle of Zephaniah was the Urtica urens L, also known as the burning nettle, dwarf nettle, and small nettle. The burning nettle grows best in temperate regions and is thought to be indigenous to Europe. 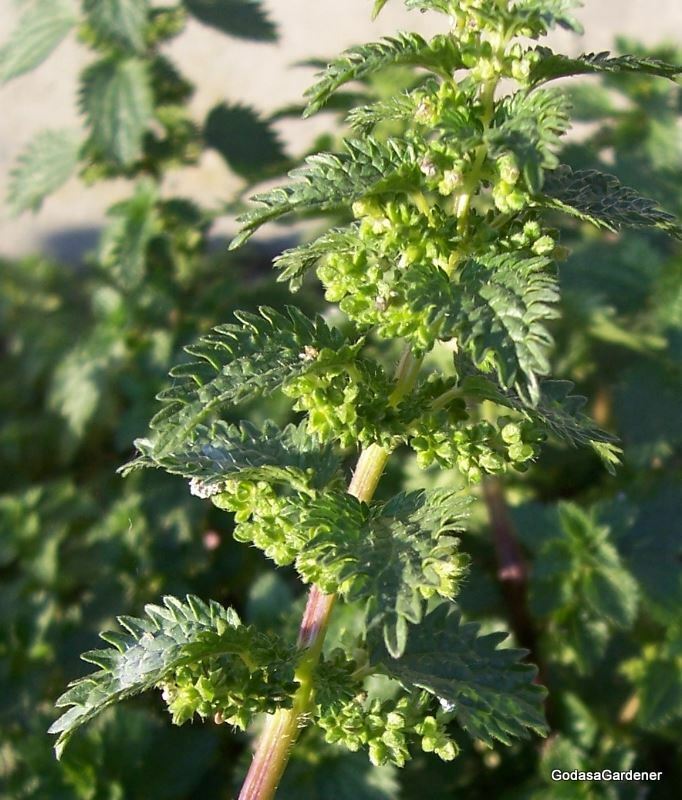 In Israel, nettles grow in disturbed sites such as ditch banks, road sides and fence rows; however, it does well in vegetable gardens and orchards. Urtica urens does not tolerate shade. Both the leaf blade and slender stalks grow stinging and non-stinging hairs. Stinging hairs are long, sometimes bristly. Prickly hairs contain two parts 1) a softer vessel at the base and 2) a minute tube-like structure tipped by a round bulb. When a hair contacts the skin, the bulb breaks off, exposing a needle-like point. The point penetrates the skin and injects an irritating substance. The outcome is a burning dermatitis which can last more than 12 hours. Burning can occur even after visible symptoms (redness, swelling) fade. Unlike poison oak which affects only a portion of the population, nettles burns the skin of everyone who comes into contact with it. Gloves should always be worn to protect the skin from the hairs. In the prophecy of Zephaniah against Moab and Ammon, the burning nettle symbolized burning and fire. Burning means to destroy by fire. Fire occurs from combustion of a fuel and results in light, flame, and heat. In the Bible, sometimes fire and burning had a positive meaning, e.g., the burning bush, the cloud of fire above the Tabernacle. Equally, burning and fire had negative connotations, often describing destruction. For example, Isaiah (5:24) prophesied that Judah who rejected God was to be destroyed as fire licks up straw and as dry grass sinks down in flames. We know that the reason Sodom and Gomorrah were destroyed by fire and burning was the extreme evil and perversions that occurred in these cities reached to the heavens (Genesis 18:20). In comparison to Sodom and Gomorrah the behavior of Moab and Ammon didn’t seem too bad; their sin was taunting and insulting the Israelites and threatening to occupy Israelite territories. To understand the extent of Moab’s and Ammon’s taunts, read Ezekiel’s prophecy. Ammon rejoiced maliciously when God’s sanctuary (Temple) was desecrated (Ezekiel 25:1-7). When Moab saw Judah vulnerable and fall, they discounted Judah’s God (Ezekiel 25”8-11). They did not recognize that Judah and the God of the universe were separate entities. Sometimes I feel frightened when I hear or read of clergy, politicians, and ordinary citizens mocking God and discounting God. Equally, when the United States waffles in its support of Israel, I feel disquiet. Do these individuals know Bible and secular history? Do they know that Israel holds a special place in God’s eyes and heart? God may punish the Israelites with burning fire; but, he will never destroy them or reject them totally. God’s plans are to redeem a remnant of the Israelites (Zephaniah 3:8-20). God said, “at that time I will deal with all (nations) who oppress you (Israel” (Zephaniah 3:19, NIV-SB, 2003). Prayer. God, help me to never discount what you do in our national life as well as in my individual life. Help the United States to never oppress the people of Israel. This entry was posted in Plants & the Southern Kingdom - Judah and tagged Bible, Bible Plants, Bible Prophecy, Bible Study, burn, burning nettles, Christian walk, christianity, fire, Garden, Gardener, God, God as a Gardener, History, Israelites, Jerusalem, Jews, Judah, Old Testament, Plant symbolism, plants, spirituality, Urtica urens, Zephaniah. Bookmark the permalink.